The champions of this family are Leptophlebia and Paraleptophlebia. 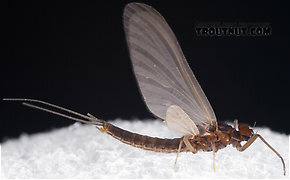 The large mayflies of Leptophlebia are on the water sporadically for a long time. The Paraleptophlebia flies are smaller but come in much more concentrated numbers. Leptophlebiidae also contains several genera and species which are never mentioned in fly-fishing literature, either because they are too rare or because they require water too warm for trout. Looking at Purdue's May Fly Central it shows nebulosa being found in Canada's Far North, North East and North West as well as USA's North East, South East & Far West. Yes, the Paraleps can come about the same time as the tricaudatus, but don't start as early I think. And I think they were a mid-morning deal where tricaudatus has more of an afternoon peak. (Here in the rockies we're not supoosed to don't have the early P adoptiva, although last spring I found a single youngish nymph that my key would only take it to adoptiva -by gills if I remember right. Wish I'd pickled it and had it properly ID'd. Anyway, back east I found the Paraleps emerged from slower currents and siltier substrates -often along stream edges. Whereas tricaudatus spilled out of the riffles. They could mix of course in certain places, but one could find one predominant if you wanted to (and I did bc I wanted to know each better), by focusing on key habitat. Fly patterns could be identical really, although I had my own, esp for the nymphs. In fact, I'm still using some P adoptiva mimic parachutes (more a dun gray) during Baetis activity. P. adoptiva is an eastern species. By far the most important species in the West is P. debilis, though they can be found mixed with others, particularly the unusual tusk bearing species bicornuta and in some locales packii. Anglers that occasionally come across these tuskers often confuse them with the immature burrowing ephemerids they resemble. 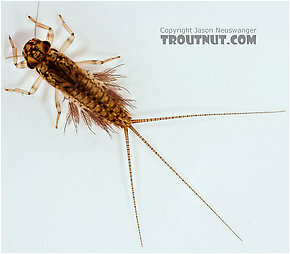 Many anglers use their standard nymphs and do just fine with them. The PT is a popular pattern. Sometimes, a nymph that more accurately suggests their silhouette is the ticket. Because of their build and very obvious gills, they look more like a small long-tailed burrower than they do the typical baetid or ephemerellid, and it is good for the angler to keep this in mind. Most duns and spinners are typically a rich brown, hence the name "Mahogany Dun." They can run the gamut from gray to almost black though, depending on the location. 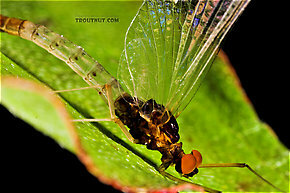 The slender bodies and coloration of the duns lead to them often being mistaken for baetids, but the oval vertically held hind wings and three tails make them easy to distinguish from that family. Check out this link to the hatch page for a look at the natural dun. Below are a couple of patterns I find very useful when this critter is about. Over the past several years I have witnessed a spectacular emergence of mayflies on a stream I frequent in the Mogollon Rim area of Arizona. The stream is a tributary to the Little Colorado River drainage. The adults seem to emerge on exposed midstream rocks of along the shoreline. The duns can be very dense, sometimes every rock along shore has one drying its wings beforetaking flight They are a dark greyish brown bodied, dark grey winged adult, I have named them MOCHA DUNS for lack of knowledge of their true identity. Three tails on the adult as well. They are pretty big....a big size 14 to 16. I have captured several specimens as larvae that I believe are the same species as the ones I have observed as adults. The larvae have prominent gills. 3 long split tails, similar size and color, hign densities along shore and in the shallows, etc. I'm 90% sure that they are Leptophlebiidae. But I don't know the species, yet. The trout don't seem to key in on the adults...since they emerge on land...but I have experienced some incredible fishing during very windy days while the hatch is on. The nymphs appear to have trouble holding on to the substrates they are trying to emerge on. I have witessed several swimming to a streamside cobble, grasping the rock for a moment, only to be swepped back into the water by small, lapping waves being caused by the wind. They try repeatedly but seem to get exhausted pretty quickly. They must be easy picking for fish cruising along the bank, as I have great success fishing imitations along the shore with short twitches. I have rarely seen duns on the surface of the stream, even on the windiest of days. They seem to emerge late morning to early afternoon. I can't remember where I read or heard these things (might have been on this site), but I want to make sure my vague recollections are not totally false. When Paraleptophlebia are mating, do they make exaggerated dives in clouds above the stream? If so, do they often end up in the water at these times or do they fall as spinners much later? Finally, when they emerge, do they do so at the stream bottom and then swim to the surface as duns? This is one of the species that seem to be prevalent in our area of southwest NC. It emerges in March as I recall and again in October on certain streams. I would like to confirm that this next season.